Celebration in the second hat-trick of FC Barcelona, which took place at the end of the football season at the Camp Nou stadium, Christie had as protagonists in his show projection of last generation of the signature systems. 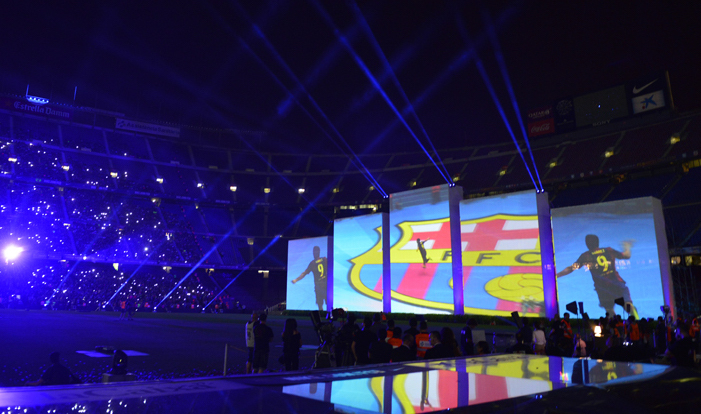 For this event, organized by the Agency Eventsfive projectors were used Christie Roadster HD20K-J from the hand of Eikonos and the collaboration of Nine eyes to make the contents of the projection that about 70,000 fans in the stadium of FC Barcelona, looked next to his players and coaching staff of the team. Five large structures or totems installed in the 'South 'goal symbolized the five Champions achieved by the club, on which were projected images of the most important moments of the season, as well as three competitions won this year: League, Cup and Champions. Projectors Roadster HD20K-J, 3DLP technology, 20,000 lumens and HD resolution, settled 90 metres in height in order to not make shadows of the players on the stage. The timing of the projections was Dataton Watchout 6 system with Xeon computers. For Ricard Galindo, Manager of Eikonos, "projectors gave it everything and we especially like the ability to put them in vertical without any problems, as well as its reliability."